What are Bluetooth Headphone Adapters and Why Do We Need Them? Do you have your house filled with different kinds of wired devices that are too old-fashioned to be used? We have the right solution for you! We have prepared the list of 17 best Bluetooth headphone adapters that can save you some money and make your life much easier. We are sure everyone has at least one pair of wired headphones, earbuds or speakers that they bought long time ago. The devices still function perfectly, but the wires make our lives more complicated. Now you can save a lot of money and keep using your favorite devices because the scientists have produced small devices called adapters. Some of them work as receivers, others have the role of transmitters, and some devices are able to do both tasks. Right now, we need receivers, but many of the adapters on our list of 17 best Bluetooth headphone adapters are transceivers, which means they can be both receivers and transmitters (but not at the same time). The devices on the list belong to different categories of adapters and to different price ranges. You will see some extremely cheap adapters with many features, some middle-priced devices, as well as some expensive products with only one feature. Anyway, you don’t have to worry. We will try to elaborate on all the things you should pay attention to when buying products like these. It all depends on your needs and the type of devices you have at home. Bluetooth headphone adapters are small devices produced in different shapes (square, round, etc.) and different sizes, but they are usually extremely small and light, which makes them portable and that is one of their main features. These adapters have their own controls, sometimes even built-in mic and their battery is rechargeable. The battery life varies from adapter to adapter but it is usually long enough for all kinds of outdoor/indoor activities (5-8 hours). The main purpose of Bluetooth headphone adapters is to receive Bluetooth signal from some Bluetooth enabled device instead of wired headphones, speakers, etc. Most of these adapters have 3.5mm universal port, so you can insert the jack of your headphones or speakers into the port and make your old wired devices wireless. That way, you bring your old devices back to life and make them useful again by adapting them to the requirements of the modern world and busy lifestyle. Of course, some adapters have different ports but most of them have at least one 3.5mm port. Bluetooth receivers are used to receive Bluetooth signal emitted by Bluetooth enabled device and send it to the non-Bluetooth device. That way, Bluetooth receivers are used to add a Bluetooth feature to wired or older devices that don’t originally support that technology. The receivers can be used with wired headphones, wired earbuds, wired speakers or with car stereo system. Bluetooth receivers usually come with at least one 3.5mm audio cable or connector. You use them to connect the non-Bluetooth device to the receiver. For example, if you have old earbuds with 3.5mm jack, you just have to insert the jack into 3.5mm port on the receiver, pair the receiver to the Bluetooth enabled device (phone, tablet, iPad, TV, etc.) and you are ready to go. In case you have wired headphones with detachable cable, you can buy the receiver that comes with the short 3.5mm connector, insert the connector into the port on the headphones and that’s it. You can use the same procedure in your car and stream the music from your phone to the car stereo system. Bluetooth transmitters look the same as Bluetooth receivers with some differences. The transmitters have more than one port. Apart from the standard 3.5mm aux port, they can have RCA port, optical port, etc. They are physically connected to some non-Bluetooth device like TV, desktop computer or any other smart device without Bluetooth. Once connected to those devices, the transmitter has to be paired with some of your Bluetooth devices such as speakers, Bluetooth headphones, earbuds, etc. The transmitters can usually be paired with two devices at the same time, which means you can use two pairs of Bluetooth headphones to watch a movie with another person without disturbing kids or someone else. Bluetooth transceivers are adapters with dual nature. They have all the necessary ports and cables to work as both receivers and transmitters. There is only one small button that has to be pressed in order to switch between modes. That way, you can buy 2 products in one and, as you can see from our list, those products aren’t very expensive and can be useful in any house. The one important thing is to prepare the device properly by selecting the mode before turning the adapter on. If you’re reading this article and if you have wired headphones or speakers that should be turned into wireless, the device you need is a Bluetooth receiver (or Bluetooth transceiver). In the text below, you will find their most important characteristics and find out all their advantages and disadvantages. Besides, we will explain the best way to buy the perfect adapter for your needs by instructing you what to pay attention to during the buying process. If you’re not sure whether you should buy a Bluetooth headphone adapter, here we have some basic advantages of using these products. Maybe these facts can make it clearer for you if you need these adapters or not. These adapters (receivers) are usually very small. On average, at least when the adapters from our list are concerned, their size doesn’t go over 3 inches and only some specially shaped adapters can be longer. They are thin and light, too. The weight of these products doesn’t become greater than 1 ounce. Because of all these characteristics, Bluetooth adapters/receivers are highly portable. You can put them in your pocket or bag, even attach them directly to the ear cup of your full-size headphones and you won’t feel any additional weight. Some of them even have clips on the backside so you can attach them to your shirt, your pocket or something else. That is particularly useful for working out and running. As we have previously said, Bluetooth headphone adapters usually have 3.5mm aux port that most of the devices have today. They also come with 3.5mm male-to-male audio cable that can be used to connect them to non-Bluetooth devices. That way you can easily connect it to your car stereo system, different kinds of wired headphones or speakers. You can find some special models with special ports and connectors (such as 30-pin port), but most of the products on our list are universal adapters that can be used by anyone in any situation. They don’t literally cut the wires. The wires won’t magically disappear (unless you have headphones with detachable cables), but you can be sure that your movements will be easier and you will have more freedom. For example, you won’t be directly attached to your phone, you won’t risk unintentionally dropping it on the floor or in the street and breaking it. Bluetooth headphone adapter can lay in your pocket or be attached to it, while your phone (or player) stays in some safe place (but still within 33ft range approximately). Besides that, if you use the adapters with your speakers, you will have significantly fewer cables in your house, especially if you have large surround systems made from several separate speakers. Mpow Streambot is one of the most popular adapters on Amazon. It is square-shaped, very small (2.4×4.5×2 inches) and it weighs only 1.28 ounces. The product comes in black/silver, black and red/black color combinations. Mpow Streambot is primarily car adapter, but it supports Bluetooth 4.0 (or Bluetooth 4.1 supported by the newer version) with 30ft signal range and it has 3.5mm input/output port so many people use it to make their wired headphones and earbuds Bluetooth and more user-friendly. The adapter/receiver is very simple. It has one 3.5mm port, one USB port, volume controls on the right side and the multifunctional button on the front side. The LED indicator light is at the bottom and it shows you when the product is on, when it is pairing or when it is paired with some phone or some other Bluetooth enabled device. It has the battery that can last between 8 and 10 hours per charge. Recharging takes 1.5 hours. The adapter comes with one micro USB to USB charging cable, one 3.5mm audio cable, one metal 3.5mm adapter and user manual. Mpow Streambot has more than affordable price. It is quite cheap and it works nicely for the money. The range of available colors is quite satisfying, the product is attractive and it has compact size so it can fit any pocket. The buttons are responsive. You can use the multifunctional button to play/pause the music, pair the adapter to your device or answer/reject calls. It also has built-in mic, so you can talk normally without the necessity to disconnect it and use the phone. The + and – buttons can be used to control the volume (long press) or to skip tracks (short press). The product can be used during charging, which is also one great feature. Streambot can be used in cars with 3.5mm port (using the short metal adapter or the audio cable) or you can use it to make your wired headphones or speakers wireless. The Bluetooth connection is easily established with both Android and Apple devices and most of the time it works nicely. The quality of sound is more than decent for the cheap Bluetooth device. Truth to be told, Mpow Streambot is cheaply built product. It is completely plastic and some people reported that the adapter was melted and destroyed during charging, so pay attention to the charging process. Also, the signal cutouts will eventually appear and the signal range is not as long as advertised, so it is better to keep the adapter very close to your device. In addition, the battery status icon will appear only on Apple devices, not on Android devices. The mic doesn’t pick your voice nicely if the adapter is not near your mouth. The adapter doesn’t have aptX low latency codec and you might have problems with delays in case you use it to watch movies. CoolStream Duo is the affordable Bluetooth receiver that helps you save some money and turn old wired devices in your house or car into Bluetooth enabled items. It supports Bluetooth 3.0 version, the signal range is 30ft at max and the battery offers up to 5 hours of playback after being fully recharged (recharging takes 2-3 hours). The adapter is very small (0.4×1.2×0.8 inches), it fits anybody’s hand and it is extremely light. The product comes in black color. CoolStream Duo comes in the partially transparent box with the user manual and the 3.5mm audio cable. The adapter is nicely designed and it looks attractive. The size is very compact and it fits any pocket without adding any extra weight to your headphones, earbuds, etc. On the front side, you will see only CoolStream logo. On the top, there are power on/off switch, 3.5mm aux port and the LED indicator light. On the bottom, you have 30-pin port for the older devices with 30-pin connector. The build quality is quite satisfying, it is even better than you would expect for the price. The adapter allows you to turn all non-Bluetooth devices with 3.5mm connectors into Bluetooth enabled devices. That means you can connect any of your wired earbuds that lay forgotten somewhere in the house to the adapter and use them as Bluetooth earbuds. You can do the same with old speakers, or any other device. Besides, the 30-pin connector can be used with devices like iPhone docking stations, Bose SoundDock, Apple HiFi Dock and many other older devices. The complete list of compatible devices you can find on the CoolStream site and see if you have any of them. The sound quality is not too affected by the Bluetooth connection and the adapter enables you to enjoy it wirelessly. The music gets quite loud and pleasant. 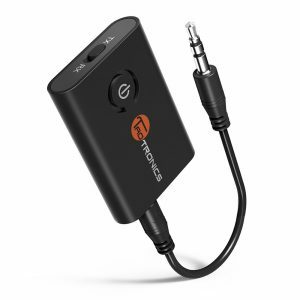 With the help of this small adapter, you can bring your favorite music with you anywhere without worrying about wires. 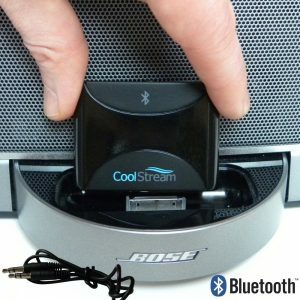 CoolStream Duo is basically made for the people who have 30-pin charging cables or devices with this connector. The only way to charge the adapter is to insert 30-pin connector into the 30-pin port on the receiver. You can’t use 3.5mm port for charging and there is no USB charging port, which should have every receiver and transmitter. The adapter doesn’t have the mic, volume controls, etc. That means you won’t be able to make hands-free phone calls or use the adapter to turn the volume up or down, or skip between tracks. You will still have to use your phone or some other device to do that. CoolStream Duo doesn’t support aptX low latency. Its battery life is shorter than average, especially considering the price range. Charging hours should be shorter considering the battery lifetime. TaoTronics TT-BR05 is very cheap but very useful and nicely built receiver/adapter. It is very small (2x1x0.4 inches), square-shaped and it weighs only 0.64 ounces. The adapter comes in black/silver and all-black versions and it is quite easy to use. It supports Bluetooth 4.1V with decent signal range and it allows you to connect to two Bluetooth enabled devices at once. The battery has acceptable life length (10 hours) and the built-in mic allows you to answer any call that comes while you’re driving, running or doing something else. The adapter comes in the recycled cardboard box with its user manual, 3.5mm male-to-male metal connector, 3.5mm audio cable and micro USB to USB charging cable. In comparison to Mpow Streambot and some other adapters, TT-BR05 is nicely built product. It doesn’t feel cheap, mostly because of the nicely rubberized surface. The adapter is very small and light, which makes it user friendly. It can fit in a pocket or even be attached to full-size headphones and you won’t notice any change of weight (although it will look a bit strange). On the front side, you will see the round multifunctional button (used for turning the adapter on/off, playing/pausing music, answering/rejecting calls and pairing) and the small mic. On the left side, you have 3.5mm port, the volume controls (also used for skipping tracks if pressed shortly) are on the left side and the USB charging port is on the bottom. The Bluetooth works nicely and the sound quality remains mostly satisfying. TT-BR05 can even make your songs or audio books louder than your car-radio or phone would. The product feels compact and strong. It allows you to make any wired device (headphones, earbuds or speakers) wireless and use them as regular Bluetooth devices. Besides, the adapter works nicely with both Apple and Android devices, and you will see battery status icon on both types of devices. TT-BR05 has problems with its mic. As you could expect, it won’t pick your voice nicely unless you come closer to it so your lips are next to the adapter. If you find it annoying, you better don’t use this device for making calls. Some static noise and humming can be heard when the music is not playing. Although it disappears right after you play your audio content, some people find it annoying. In addition, you might feel the lack of bass; the sound will be a bit flat, without powerful punchy bass sequences. TT-BR05 doesn’t have aptX low latency codec, so you shouldn’t use it for watching films or any video content. BAL-M40x and BAL-M50x are two Bluetooth adapters made by the company called East Brooklyn Labs specially for ATH-M40x and ATH-M50x models. And that’s a great thing. ATH headphones are already extremely popular headphones with the amazing sound quality for both professionals and ordinary customers. Their only problem has been cables, but now you don’t have to worry about that either. BAL-M40x weighs less than 1 ounce and its dimensions are 4.4×1.3×2.7 inches. BAL-M50x has the same weight but it is a bit smaller (1.7×1.1×0.5 inches). Both adapters support Bluetooth 4.1V, the battery needs 30-45 minutes to fully recharge and it can last up to 6 hours. The products come with micro USB to USB charging cable. These two Bluetooth headphone adapters are nicely designed and they come in black color with matte finish that doesn’t attract fingerprints at all. The shape is a bit strange at first but it fits perfectly the ear cups. The connector is smaller than 3.5mm connector, which makes it difficult to find the right adapter for ATH headphones and this one fits the port perfectly. You just push the adapter into the plug, you hear the click sound and it is all set up. On the front side of the adapter, you will see the multifunctional button with Bluetooth sign on it. It is used to play/pause music and answer/end calls. Around the button, you will find volume controls. The power on/off button as well as the LED indicator light are on the bottom. There is also micro USB charging port. The great thing about these adapters the light weight. They fit so perfectly your headphones that you won’t even know they are on your head. There is no extra weight or any discomfort. It even makes the cups look more interesting. The sound quality you get is really amazing as the manufacturer has been trying to preserve ATH sound quality. You will even get that punchy pleasant bass that you expect from wired headphones. BAL-M40x and BAL-M50x are made only for specific models of headphones and they can’t be used with any other model. They have plastic built, which makes them fragile and some customers have reported that they are afraid that they will break the adapter or the headphones if they try to pull out the adapter. The adapters cost more than many other adapters that can be used as both receivers and adapters, in cars, with headphones, speakers, etc. BAL-M40x and BAL-M50x don’t have aptX low latency codec. Anker 2-in-1 adapter is both receiver and transmitter in one small product. It can be used both ways and one small button helps you switch between the modes. It helps you turn all kinds of 3.5mm non-Bluetooth devices (headphones, speakers, TVs, players, etc.) into Bluetooth enabled products. This adapter is very small (2×1.4×0.5 inches), it weighs only 1.7 ounces, it supports Bluetooth 2.1V, A2DP profile and its signal range goes up to 33ft. The battery can live up to 6 hours in receiver mode or 11 hours in transmitter mode. The product comes in black color only. The product comes in a simple cardboard box with the user manual, 3.5mm aux cable and USB charging cable. Anker 2-in-1 or Anker MB220 (as they also call the product) is very compact and very simple, but also useful adapter. It has simple but attractive design and we consider it durable as it is completely made from aluminum. The cables are also of high quality and they feel nice and durable. On the front side of the adapter, you will see big round power on/off button that is also used for pairing with your devices. On the top, you will see 3.5mm aux port, LED indicator light as well as micro USB charging port. On the right side, there is the button that allows you to switch between transmitter and receiver modes whenever you want. The product is very simple for use and it is so small and light that you can simply connect it to your headphones and put it in your pocket. You won’t even know it is there. Besides, you don’t have to use it that way. You can use it to make your TV or player wireless and send the signal to your Bluetooth headphones via MB220. 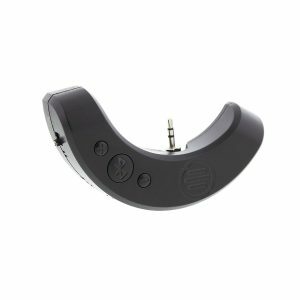 Apart from being well-built, the adapter allows you to maintain the sound quality of your headphones at very satisfying level with quite a few cutouts or other common problems for these devices. MB220 doesn’t have volume controls and it doesn’t allow you to answer calls while streaming from your phone. That means you will have to reach for your phone although the adapter lays in your pocket connected to your headphones. Although the Bluetooth works nicely, we have to complain about the Bluetooth version the adapter uses. This is the time when everybody is starting to use Bluetooth 4.2V but Anker is still using 2.1 version on this product. MB220 doesn’t have aptX low latency codec and it won’t prevent delays that are common when you’re watching movies via Bluetooth connection. 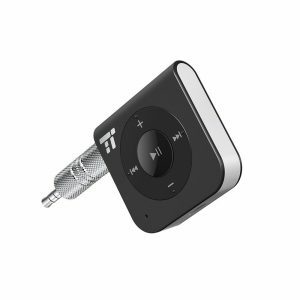 TaoTronics TT-BA07 is the affordable black adapter that can be used as both receiver and transmitter of Bluetooth signal. It uses Bluetooth 4.1 version and the signal range is 33ft at maximum. It can be paired to two devices at the same time, the battery lasts up to 10 hours and the device has aptX low latency codec, which means it enables watching movies on TV without noticeable delay. The manufacturer offers 12+6 months of extended warranty as well as very good customer service. There is also the newer version of this product that offers longer signal range (up to 20m). The dimensions of the adapter are 1.7×1.3×0.3 inches while it weighs 0.5 ounces approximately. The adapter comes in a cardboard box with 3.5mm audio cable, USB to micro USB charging cable, 3.5mm female to 2 RCA male cable and user manual. TT-BA07 is well-priced and very useful product. It is nicely designed. It comes in black color with matte finish and it is well built, made from aluminum and it feels very solid and durable. The ports look good and the device is nicely put together. On the front side, you will see round power on/off button also used for pairing the adapter to your devices. The button also has LED indicator light that informs you about the status (on/off, standby, pairing or paired). On one side, you will find the button that allows you switching between TX (transmitter) and RX (receiver) modes. On the other side, there are micro USB charging port and the aux 3.5mm port. The cables are nicely built, short and they feel durable. The good thing is you can use the adapter with all kinds of devices, not only with old wired headphones/earbuds that you want to bring back to life with some Bluetooth signal. 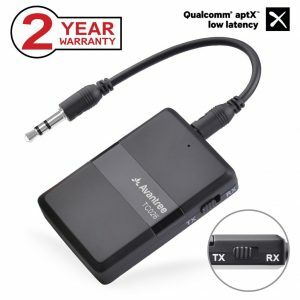 You can use it to connect devices like TV to your Bluetooth headphones or speakers and watch some video content lag-free as the adapter has aptX low latency codec. In case you want to listen to some music, it is enough to pair the adapter to your phone, connect the adapter to your earbuds, put the small adapter in your pocket and you are good to go. The sound quality will be very good and Bluetooth connection won’t destroy it. TT-BA07 doesn’t have volume controls nor it allows you to answer a call without reaching for your phone. The multifunction button doesn’t support that feature and the phone will be your only option. Some people have reported humming sound that the adapter produces when you use it during charging. 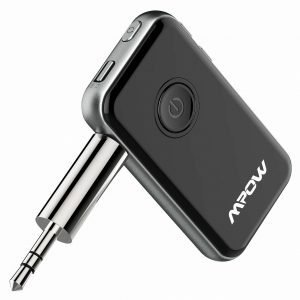 Mpow 2-in-1 transmitter and receiver is very small (2x1x0.4 inches) and very light (0.4 ounces) product. It comes in black color with Bluetooth 3.0 version (it supports A2DP and AVRCP profiles) and the signal range up to 33ft. The battery requires 2 hours of charging and after that, it can last for 8 hours (in transmitter mode) or 6 hours (in receiver mode). The adapter offers two working modes and it can be connected to anything with 3.5mm port or paired with any kind of Bluetooth enabled devices, but only to one device at the time. It is great for cars, watching TV, listening to music via home speakers, or making your wired headphones wireless. The adapter comes in a simple typical Mpow cardboard box with the 3.5mm audio cable, user manual and USB charging cable. 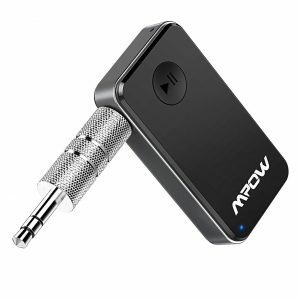 Mpow 2-in-1 Bluetooth transmitter/receiver has very compact and simple design. However, it looks rather attractive, mostly because of the nice matte finish. The surface is rubberized and very soft, but the product seems rather well-built. On the front side, you will see Mpow logo and the round silver button with the LED indicator light. The button is used to power the adapter on/off and to pair it to your Bluetooth devices. The LED light will switch between red and blue during pairing and it will turn blue once it is paired. On the top, you have 3.5mm aux and micro USB charging ports. On the side, you will see the button that allows you to switch between TX (transmitter) and RX (receiver) modes. The adapter is compact, so small and light that you can take it anywhere you go. If you decide to connect it to your wired earbuds or headphones and go outside, the adapter will fit perfectly your pocket and you won’t even feel its weight. If you decide to use it to make your speakers wireless or transmit the signal from your TV, the adapter won’t occupy much space. You will barely notice it but it will do its job very well. The buttons are highly usable, the adapter and the cables seem well-built and one of the most important things is that the sound quality remains good in spite of the Bluetooth connection. 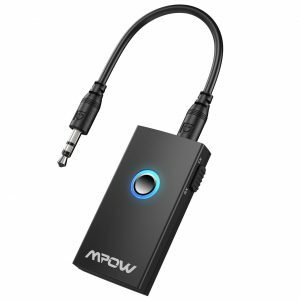 Mpow 2-in-1 adapter doesn’t have aptX low latency codec, so it is not good for watching movies on TV because you will notice significant delay. Also, it doesn’t have volume controls, the button that you could use to answer calls or the mic. The pairing process is longer than on some other adapters on our list of 17 best Bluetooth headphone adapters. The adapter uses the old version of Bluetooth. Some people have reported that the recharging process can last significantly longer than 2 hours and that they notice humming sound whenever there is no music playing. One more TaoTronics Bluetooth receiver is on our list of 17 best Bluetooth headphone adapters and that’s for no reason. This company makes very popular products that don’t cost a fortune but offer decent quality, so it is no wonder they are often on these lists. The adapter supports Bluetooth 4.1 version with up to 33ft of signal range. The battery needs 1.5 hours to be fully recharged and after charging, it can offer up to 15 hours of constant streaming. The adapter is very small (1.6×1.6×0.4 inches) and it weighs only 0.64 ounces. It comes in dark grey and black/silver colors. TT-BR06 comes in the simple box with its user manual, 3.5mm male-to-male audio cable, short metal male-to-male 3.5mm connector, micro USB to USB charging cable, adhesive tape and 18-month warranty card. TT-BR06 has very compact size and it is extremely light. It is made from quality plastic and it feels quite durable. The matte finish gives it some kind of elegance and it feels very nice when you hold it. The adapter fits any pocket and it doesn’t add extra weight to your headphones. The manufacturer sends you small piece of adhesive tape that can be attached to the back of the adapter and in order to attach it so some surface. For example, you can attach it to the control board in your car or to the ear cup of your full-size headphones. 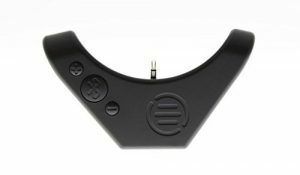 On the front side of the adapter, you have TT logo and the control buttons are distributed into two circles. In the smaller circle, you have power on/off button that is also used for playing/pausing music as well as pairing. In the outer circle, you will see volume controls as well as separate controls for skipping tracks. Below the controls, you have small built-in mic that works nicely and enables you to answer calls anytime and anywhere. On the side, you have 3.5mm port while the micro USB charging port is on the bottom. The adapter performs nicely considering the price. It is perfect for making old non-Bluetooth devices wireless. It saves you money and adapts your loved products to the modern lifestyle. Your old wired headphones or earbuds suddenly become portable and modern just like your old wired speakers can be used normally without annoying cables scattered all over your house. The signal range is decent and the battery life is long enough to support most of your daily activities like long rides, traveling or working in some office. It can also connect to two Bluetooth devices at the same time enabling you to, for example listen to music from one and taking calls from the other. TT-BR06 doesn’t support aptX low latency codec so we wouldn’t recommend using it for watching movies. Here we have one more Mpow product on the list. It is similar to the others and it is very popular among customers. It is not expensive and it works nicely for the price. The adapter works in two modes (TX and RX) and in TX mode, it can be paired with two devices simultaneously. It has built-in mic and separate volume controls. The product comes in black color with silver or grey details. It is very small (5.7x3x0.7 inches) and it weighs only 3.2 ounces. It supports Bluetooth 4.1 version with 33ft signal range and the battery can last for 12 hours per single charge. The product comes with 18-month warranty and 45-day return period. The adapter comes with micro USB to USB charging cable, 3.5mm male-to-male audio cable, short metal 3.5mm audio adapter, RCA cable and the user manual. 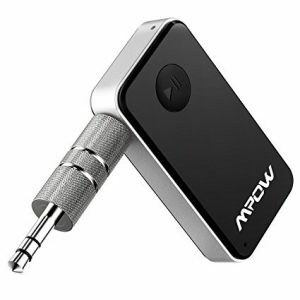 Mpow Bluetooth receiver/transmitter is simply designed useful product. It is small and lightweight and you can use it as receiver as well the transmitter. On the front side of the adapter, you will see big round power on/off button that is used for turning the adapter on or off, playing/pausing music or answering calls. On the top, there is the button that is used to switch between the modes. On the left side, you have 3.5mm port while the volume controls (also used for skipping between tracks) are on the right side. At the bottom, there is the micro USB charging port and the LED indicator light is on the front side. If you press volume controls simultaneously, you will activate Siri or Google assistant depending on the phone. The adapter is nicely built. It is mostly plastic but it feels nice in hands. The performance is quite decent for the price, the sound can be quite loud and the Bluetooth connection doesn’t affect significantly the sound quality. The adapter can be used in cars, at home or on the go. It is small, highly portable and it can make your activities much easier, especially driving. The battery life is more than satisfying and perfect for long trips. This adapter doesn’t support aptX low latency codec and we don’t advise you to use it to watch movies on TV via Bluetooth. The glossy finish on the plastic material looks a bit cheap, although the adapter looks quite attractive. Besides, it attracts fingerprints and can become dirty in a few seconds. When in receiver mode, the adapter can’t be connected to more than one device at the same time. Avantree TC026 is another relatively cheap but very useful product that combines receiver and transmitter characteristics. It can work in both modes and in the TX mode, you can connect it to two devices at the same time. The product is quite small (2×0.4×1.5 inches) while it weighs only 0.8 ounces. TC026 supports Bluetooth 4.1 version with maximum 33ft of signal range and A2DP and AVRCP profiles. The battery is rechargeable and it can last up 10 hours. The adapter can be used in cars, at home, for sending or receiving Bluetooth signal and refreshing and bringing back to life some older non-Bluetooth devices instead of buying new Bluetooth-enabled ones. The adapter supports aptX low latency (in TX mode). The adapter comes with user manual, quick user guide, USB charging cable and 3.5mm audio cable. Avantree TC026 is quite attractive square-shaped small device. It comes in black color. It is well built with some aluminum elements that look rather good. It has matte finish, which is great as it doesn’t attract fingerprints and the device looks much cleaner. On the front side, you will see Avantree logo, model number and LED indicator light. On the top, there are 3.5mm aux port and micro USB charging port. On the left side, you will see volume controls and the power on/off button (also used for pairing). On the right side, you have the button that allows you to switch between TX and RX modes. As you can see, the device is pretty simple, but not only by design. TC026 is very simple to use. If you press and hold the power button for a few seconds, you will turn the adapter on or off. If you press it quickly twice, you will enter pairing mode. You can change volume settings by holding the buttons for a few seconds or you can shortly press them to skip between tracks. The build quality seems fine and the product seems sturdy and durable. The cable quality is also more than satisfying. The adapter can be connected to different kinds of devices and in different ways. You can use TC026 as receiver and connect it to your wired earbuds, pair it to your phone, put it in your pocket and go anywhere you want. The battery is strong enough to last until you finish everything you need. Besides, you can use it as transmitter and connect to some older TV and the device will send Bluetooth signal to your wireless headphones or speakers. The important thing is that the adapter doesn’t change the quality of the sound so much. TC026 can’t be used for answering calls as none of the buttons support that feature, so you’ll just have to reach for your phone in case someone calls you. AptX low latency codec doesn’t support dual link connection. Also, when the device is in RX mode, aptX low latency is not supported. It is advised to use headphones with aptX low latency codec with this adapter in order to get the best results. 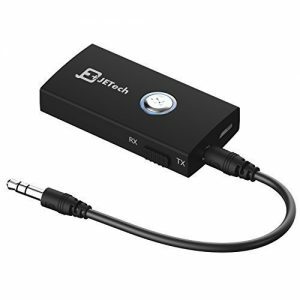 JETech 2-in-1 Bluetooth receiver/transmitter is very useful device. It can be used to transmit or receive Bluetooth signal and it can save you a lot of money. It is very cheap, very small (1×1.9×0.4) and very light (approximately 2 ounces). It uses Bluetooth 3.0 version with A2DP profile, signal range can go up to 33ft and the battery can last up to 10 hours. The adapter can be used at home (with speakers, TV, headphones) or outside (in your car, at work, etc.). It is the cheap and easy way to make your non-Bluetooth device into Bluetooth enabled and save some money. The receiver/transmitter comes in a very simple cardboard box with JETech logo with 3.5mm audio cable, user manual and micro USB to USB charging cable. JETech adapter is very useful device in any house, car or office. It comes in matte black and it feels quite nice in hands. The device is very simple but attractive and it is easy to use. The great thing is also that it offers a lot for so small amount of money. On the front side, you will see JETech logo and the big round button with Bluetooth mark on it. The button is used to power on/off the device and pair it to your Bluetooth enabled devices. On the top, you have 3.5mm aux port as well as micro USB charging port. On the side, you will see the button that enables you to switch between TX and RX modes depending on your needs and the device you’re connecting to the adapter. The adapter is plastic, but it has nice finish; it is soft and pleasant for holding. It seems durable, just like the cables. The sound quality will remain very decent and you don’t have to worry that Bluetooth connection will destroy your pleasure time. The battery lasts long enough for using during working hours, long trips or any daily activities. Besides, the device can be normally used during charging, which is the great feature. We are aware that you can’t expect much from cheap products, but we would like to add some buttons to the adapter and be able to control the volume. Also, we would like to add built-in mic and add some features to the multifunction button so that we can answer calls without reaching for the phone. In addition, the Bluetooth version is a bit old. In our opinion, it should be upgraded as the technology has developed a lot since the Bluetooth 3.0 version came out. The adapter doesn’t have aptX low latency codec. Vont Bluetooth adapter is small and very light receiver. It costs almost nothing and it can turn almost all non-Bluetooth devices with 3.5mm connectors into Bluetooth enabled devices (headphones, earbuds, speakers, etc.). The adapter has built-in mic, it can connect to two Bluetooth enabled devices at the same time and it allows you to stream music from one of them and take calls from the other one. The Bluetooth range is 30ft max and the battery can last for up to 12 hours after only 1.5 hours of charging. The adapter comes in a very simple cardboard box with the short 3.5mm male to male connector, audio cable with 3.5mm male to male connectors, micro USB to USB charging cable and the user manual. Vont Bluetooth adapter is nicely built device with small weight and compact size. It comes in black/silver color combination and it has nice matte finish. The build quality is satisfying for the price and the device seems quite durable, mostly because of the aluminum elements. On the front side, you can see the multifunction button that enables you to power on/off the adapter, play/pause music or answer calls. There is also small LED indicator light that informs you about the pairing status. On the left side, you have 3.5mm port while the volume controls are on the right side. The mic is on the top and the micro USB charging port is on the bottom. The adapter is very easy to use and it performs quite well. It won’t destroy the sound quality and you will be able to enjoy your audio content without any major problems. It pairs quickly to all kinds of Bluetooth enabled devices (even two of them simultaneously) and it is so smart that it will pause the music until you finish the call and after that, your music will continue playing without any problems. The signal range is satisfying as well as the battery life. You can count on it for longer trips or that it will make your working hours more interesting. Vont Bluetooth receiver has the design that reminds us of the Mpow and TaoTronics receivers. The adapter doesn’t have aptX low latency codec, which means it is not advisable to use it for watching movies on your TV because of the delay. 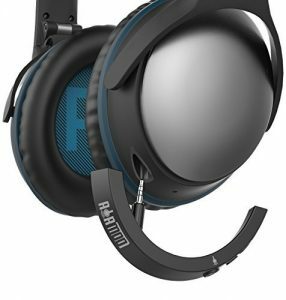 Just like the BAL-M40x and BAL-M50x were designed only for 2 ATH models of headphones in order to indulge their buyers, AirMod was designed to indulge the buyers of the famous Bose QC25 (for those who didn’t want to replace it with the QC35 on time). It is not so cheap but it is small (0.3×1.4×2.1 inches) and very light (1.6 ounces). The adapter has the built-in mic, it uses Bluetooth 4.1 version with up to 30ft range and the battery can last up to 8 hours after being fully recharged (recharging requires 1.5 hours). The company called Bolle&Raven that actually makes adapters especially for Bose products makes AirMod. Bolle&Raven has one more product. It is the special adapter for QC15 (AirMod Wireless Bluetooth Adapter for Bose QuietComfort 15) that is slightly cheaper than AirMod but still performs very well and fits the headphones perfectly. AirMod comes in the nice packaging. In the blue box with Bose logo, you will find the adapter nicely tucked in protective foam, short USB to 2.5mm charging cable and the user manual. AirMod is well-built adapter. It is made from plastic but it doesn’t seem cheap at all. It comes in black color with nice matte finish and it fits the cup of the Bose QC25 so great that it is even hardly noticeable. The adapter is very light and you won’t feel any additional weight but you will be able to move more freely than with wired headphones. The adapter has control buttons on the bottom. There are: power button with the LED indication light, play/pause button that can be used for pairing and answering/rejecting calls, as well the volume controls (also used for skipping tracks). There is also the small built-in mic that allows you to stay in touch with your friends or colleagues on the go. When you press the buttons, you will hear nice click sound. They are well distributed on the adapter so you won’t have any problems using them blindly. The most important thing is that the adapter and the Bluetooth connection don’t change the sound quality or the quality of the noise cancellation. At least, any ordinary customer wouldn’t notice something like that. The adapter pairs quickly and easily to both Apple and Android devices as well as other Bluetooth enabled devices you might have. It is cheaper than new Bluetooth headphones and it is great that you have the opportunity to find the perfect adapter for your expensive headphones. We say that because you can’t use 3.5mm adapters with Bose QC25 as the headphones have 2.5mm port. You simply don’t have any other option. You have to buy this one or some universal adapter if you want to make them wireless. Once you buy a product approved by the company that made your headphones, you know you have the right product. AirMod is more expensive than the regular adapters and the difference is not neglectable. Besides, you get to use it with only one pair of headphones and it has less features than regular adapters. Most of regular adapters (you will see many of them on our list of 17 best Bluetooth headphone adapters) work as both receivers and transmitters and they are twice cheaper. AirMod has indication light built in the power button and you can’t see which light is on if the headphones are on your head. The Bluetooth signal range is not perfect. It remains stable up to 25ft even with the obstacles, but if you go farther, the signal starts to cut out. Without obstacles, the signal range becomes longer and it can reach the advertised 30ft. The adapter can pair to only one device at the time. In addition, we have noticed some kind of static noise or hissing when there’s nothing playing. It also doesn’t support aptX low latency codec. 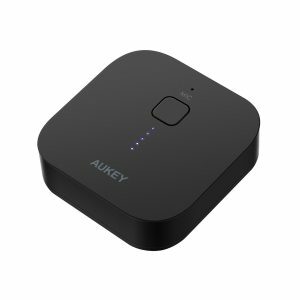 Aukey BR-C1 is small (2.2×2.2×0.7 inches), square-shaped and very light (1.76 ounces) Bluetooth receiver that is used to turn all non-Bluetooth devices with 3.5mm port into Bluetooth enabled devices and receive the Bluetooth signal instead of them. It uses Bluetooth 4.2 version and the battery can last up to 8 hours. The manufacturer gives you 45-day money-back guarantee period as well as 24-month warranty. The adapter uses small built-in mic and all the controls are reduced to one square button. The receiver comes in a cardboard box with its user manual, 3.5mm male-to-male audio cable, micro USB to USB charging cable and 3.5mm to RCA audio cable. Aukey BR-C1 is nicely designed adapter. It is extremely simple. It comes in black color with elegant matte finish that attracts no fingerprints. The surface is plastic but nicely softened and pleasant for touching. On the front side, you have LED indicator light that shows you whether the adapter is on or off, if it is pairing or paired. The big square multifunctional button is above the LED light just like the small built-in mic. On the backside, there is just nicely rubberized material that protects the adapter. On the top, you will see 3.5mm aux port as well as the micro USB charging port. The adapter is easy to use and pair, it charges quite fast (approximately in one hour) and the battery life is completely satisfying. The Bluetooth signal range can go up to 20-30ft even with obstacles and there is no major cutouts at this distance. The adapter can be used in older cars or to make the old wired headphone or speakers wireless. If you use this with earbuds, they become more portable, you just connect the adapter to the earbuds, pair it with your phone, put the adapter in your pocket and you are ready to go. Aukey BR-C1 doesn’t support aptX low latency. It is relatively cheap product and you can’t really expect so much of it. The hissing sound can be noticed even when the USB cable is not connected and if you have your earbuds plugged in the adapter at the time, the hissing sound might be too noticeable. The adapter is controlled with one single button. In our opinion, that is not so user-friendly, especially when you have the mic. Every product like this should have separate controls for the volume, answering calls, etc. 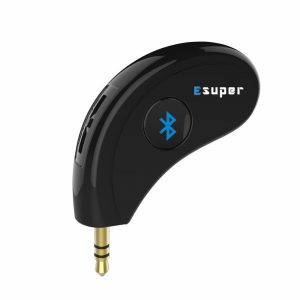 Esuper Bluetooth receiver is very cheap adapter that supports Bluetooth 4.2 version with up to 40ft of signal range without obstacles. Its dimensions are 2×1.6×0.8 inches and it weighs 0.4 ounces. The charging time is 2 hours and the battery can last up to 6 hours. 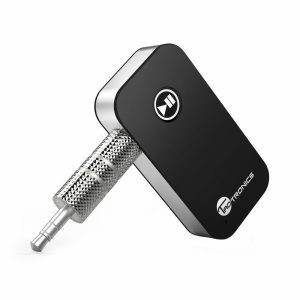 The Bluetooth receiver has volume controls as well as the built-in mic. It can be used in cars or for reliving the old wired headphones, earbuds or speakers. The adapter allows you to play/pause music, answer/reject calls and change volume or skipping between tracks. HK009 has universal 3.5mm connector that will fit perfectly any non-Bluetooth device with 3.5mm aux port. The product comes with 18-month warranty card. The receiver comes in the partially transparent cardboard box with USB charging cable, audio cable and the user manual. HK009 Bluetooth receiver is extremely affordable adapter that comes in black color with very simple yet interesting design. It has interesting shape, it is extremely light and so small that it can fit any pocket. The build quality is satisfying for the price, it is plastic but it doesn’t seem very flimsy. The adapter has built-in mic, volume controls and the multifunctional button with Bluetooth logo. There is also LED indicator light that shows you if the device is on or off, pairing or paired. It is paired easily with any Bluetooth enabled device and once paired, the blue LED light will flash every 5 seconds. Esuper HK009 Bluetooth adapter works nicely with all devices and it can be used in all situations, even for traveling as the battery is decent and the size and the weight make the adapter hardly noticeable. Besides, there is the option to make calls and talk to people any time you need with the help of its small mic that works nicely. The sound quality is decent and satisfying enough for any ordinary customer. The adapter supports relatively new Bluetooth version and the signal range is extended if there is no obstacles. First of all, HK009 can look strange if you attach it directly (without the long audio cable) to your headphones. It will just hang from the cup and it doesn’t look too attractive. Second of all, hissing that is typical for all Bluetooth devices (when there is nothing playing) appears with this adapter too. Last, the adapter doesn’t support aptX low latency codec and we wouldn’t recommend watching movies on TV via Bluetooth although some customers say that there is no significant delay. Trond 2-in-1 Bluetooth adapter is quite an affordable way of making your non-Bluetooth devices into Bluetooth enabled. The adapter comes with Bluetooth 4.1V with CSR chip and A2DP profile(the newer model supports Bluetooth 4.2V), good signal range and aptX low latency codec. The adapter is actually the transceiver, as we call the devices that can be used as both transmitters and receivers. In transmitter mode, it can be paired with two devices at the same time. Its dimensions are 1.8×1.3×0.3, it weighs 0.5 ounces and it comes with 18-month warranty and 30-day no-questions-asked guarantee. The battery can last for 8 hours at max and the charging process lasts for 2 hours. The adapter comes in the cardboard box with the short 3.5mm male-to-male audio cable, 3.5mm female to RCA male audio cable, user manual and USB to micro USB charging cable. Trond 2-in-1 receiver and transmitter is very affordable little adapter. It comes in black color with nice matte finish that makes it resistant to fingerprints. On the front side, you will see round multifunctional button with LED light that indicates if the adapter is on/off, pairing or already been paired. One long press turns it on or shuts off, while the double click turns on pairing mode. The pairing process is quite simple with all Bluetooth enabled devices. On the bottom, there are micro USB charging port and 3.5mm aux port, while button that allows you switching between modes is on the top. The adapter is made from aluminum, which makes it more durable than plastic ones. The cables are also decently made and the adapter works very nice in all situations and with all kinds of devices. It also supports aptX low latency in both modes, which makes it easier for you to watch movies on your TV via Bluetooth. In TX mode, you can even connect the adapter to two devices simultaneously. In any case, this adapter offers you great opportunity to improve your old wired device with some Bluetooth signal as Trond adapter can be used in cars, with headphones, speakers, TVs, etc. The battery life is decent and it can support most of your daily activities. 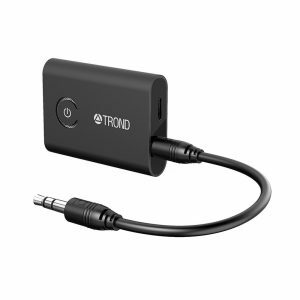 Trond 2-in-1 adapter is not made for musicians, as the low latency doesn’t work great for monitoring. It is more for ordinary users and amateur eyes and ears. The bad thing is that the adapter doesn’t have volume controls and the mic. At this price point, it shouldn’t be the case. In addition, some users have noticed problems with Bluetooth signal. They claim the range is not so long as advertised and that the signal cutouts are more often than it is tolerable. 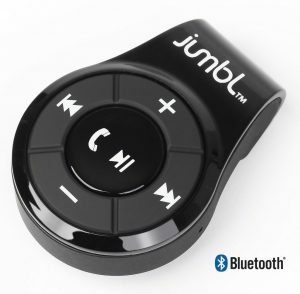 Jumble BSR36 is extremely small and lightweight adapter that supports Bluetooth 4.0 technology. The signal range can go up to 33ft, the battery can last for 8 hours of playback or 10 hours of talk time, while it needs 2 hours to be fully recharged. 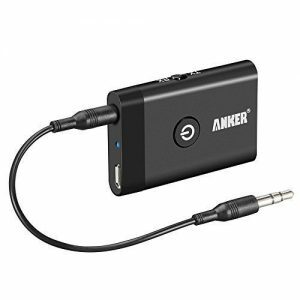 The adapter is used as the receiver only and it has all the necessary controls as well as noise cancelling built-in mic. The adapter comes in a nice cardboard box with the user manual and USB charging cable. Jumble BSR36 is the real example of the Bluetooth headphone adapter that has only one working mode. It is very simple and cheap and it works fine for the money. The adapter comes in many colors (black, white, red, green, blue) and it has very attractive design. On the front side, you will see the set of control buttons. In the middle there is the multifunctional button used for powering the adapter on/off, playing/pausing music, answering/rejecting/redialing calls. There are also volume controls and even separate controls for skipping between tracks, which is very thoughtful of Jumble. On the right side, you will see small built-in mic while the 3.5mm aux port and micro USB charging port are on the left side. On the back, you have the clip that can be used to attach the adapter to your shirt, belt or pocket while walking, running, etc. The adapter has decent battery life, the control buttons are very responsive and the performance is satisfying for the price. The pairing process is quite easy and fast and the sound quality is decent. It is not audiophile-level quality, but it should be enough for casual use. The great thing is that the adapter is small and highly portable and the clip enables you to attach it to your clothes. That is great in case you get a phone call because the mic is close to your mouth. Jumble BSR36 doesn’t support aptX low latency. It has unattractive glossy finish that doesn’t look quite elegant sometimes. It is made from plastic and although it is not badly put together, it doesn’t seem too durable considering the material. Some of the customers reported signal cutouts even when they are very close to the adapter, while the others had problems with the micro USB charging port that was badly inserted. Bear in mind that once the earbuds or headphones are inserted into this adapter, all the controls on them stop working. The only control buttons you can use are the buttons on the adapter itself. All in all, the adapter is very useful and the price is attractive, but if you get it, handle it carefully if you want it to last. Now that we have presented 17 best models of Bluetooth headphone adapters, we have to say a few words about the characteristics and features you should be looking for in a Bluetooth headphone adapter and, after all, we have to be honest and reveal some downsides of these products so that every buyer could know what he is dealing with. Just like any other device ever made, Bluetooth headphone adapters have their flaws that can be quite annoying if you don’t know how to pick the best possible product for your needs. Bluetooth is great in theory, but in practice, we are facing problems every day. It can make our everyday activities a lot easier or extremely annoying. It all depends on the product and the person using that Bluetooth enabled device. To be honest, this technology hasn’t still been perfected and it is not meant for everybody to use it. This is our way to prepare you for the potential problems you could have with Bluetooth connection and Bluetooth receivers. It is true that Bluetooth cuts the annoying wires and make your movements stress-free, but only partially. Bluetooth signal range is limited no matter what version of Bluetooth you are using. At best, you will get 300 feet, but most of Bluetooth headphone adapters use Bluetooth 3.0, 4.0 or 4.1 version and the average signal range is around 30 feet. Some products (for example some TaoTronics Bluetooth headphone adapters) offer up to 65 feet of signal range, but the average is 30 feet. That basically means that you get more freedom but only within the 30-feet range more or less. When you step out from that ‘’circle’’, you will experience signal loss and/or audio quality drop. This is tolerable if you have your phone or player in your pocket but if you have to leave it and go to another room or if you have to be in the gym and leave your phone in the locker room, it can be problematic. Sadly, even if your phone is in your pocket, you can experience signal cutouts, at least from time to time. Your headphones can even completely disconnect from your phone. That is the reason why you should be careful when choosing phones as well as headphones or, in this case, Bluetooth headphone adapters. You should always try to buy the products that can establish the best Bluetooth connection and that is something you can find out from our reviews. It may not annoy everybody, but you have to know that once you connect your headphones, speakers or car stereo system to your Bluetooth adapter/receiver, all the control buttons on your devices lose their function. That means the control pad on your wired earbuds become useless as well as the mic. The mic can even be the biggest problem since the mic on the adapter is usually not as good as the mic on the earbuds/headphones. Besides, you can’t expect the person you are talking with to hear you loud and clear if the adapter and the mic are in your pocket, far away from your mouth. The same thing happens when you’re using adapters in your car – it is possible that the call quality will be poor. The only thing you can do is to take the adapter, bring it back to your mouth until the conversation is over, but that is no longer hands-free call. Always pay attention to the ports and jacks on certain Bluetooth headphone adapter. It sometimes happens that headphones (especially some branded full-size headphones with detachable cables) don’t have 3.5mm connectors. Instead, their manufacturers use 2.5mm connectors and that is usually the main reason why some special Bluetooth adapters are made for those specific models. They usually cost more as they are the only option to make expensive wired headphones wireless. We have explained that situation on the examples of Audio Technica and Bose full-size headphones. Their customers have to use specific models of adapters and they are more expensive than regular universal adapters. When you buy a product like this, you basically get another device that has to be charged. You won’t have to worry only about the battery in your phone or tablet, there will also be the adapter that has to be regularly charged in order to work properly. The bigger problem is that many adapters can’t be used while charging, which some owners find irritating. No matter what you are buying, you have to know how to choose the best product for yourself among numerous advertised items. The market is enormous and there are some bad but also some brilliant things out there. You have to be careful and plan every purchase if you want to spend your money on quality products. We have decided to conclude our article on best Bluetooth headphone adapters with some pieces of advice that should help you during the search. Here are the most important things you have to think about. The first thing you should do when buying a new product is to carefully think about its purpose. If you want to get a Bluetooth headphone receiver (adapter), you have to realize when and how you will be using it. For example, if you need the receiver for your old wired earbuds, you should consider the smallest adapters you can get as they are the lightest and they can even be used for running or working out. If you want to use the adapter for physical activities, you should also try to get one with the clip on the back so that you can attach it to your shirt or the edge of your pocket. After defining the purpose of your new device, you have to realize how much money you have or how much you want to spend on one adapter. That is very important as it will shorten the time spent searching for the new adapter. You will focus on the products in one price range and won’t spend time thinking about those that are unavailable. Bluetooth headphone adapter has to be portable and user friendly. That mostly means it has to be as small as possible, as light as possible and that the adapter has nicely distributed control buttons so that the user spends less time setting the adapter up. For example, if you need an adapter for running, you would buy small and light adapter with a clip. If you want to be available for phone calls during your running sessions, you will look for the adapter with nicely positioned mic, so that the adapter can be attached near your mouth. The adapter should have as much separate controls as possible because it is easier to have one power button, one button for answering calls, separate buttons for controlling the volume and skipping tracks as you will spend less time learning when you need to press the button for one, two or five second in order to set the device up. Bluetooth version is very important as it affects the wideness of the signal range and the connection quality. Newer Bluetooth versions offer wider range as well as better connection and better sound quality. Older Bluetooth versions were compressing files too much and the sound quality was much worse. Today we have aptX or A2DP profiles that compress files less than older versions, making them more pleasant for listening. Most of the Bluetooth headphone adapters are compatible with the majority of headphones and earbuds, as well as speakers. If your device has 3.5mm jack and your adapter has 3.5mm port, you will have no problems. However, as we have mentioned before, some headphones have thinner connectors/ports, which means you will have to buy special adapters made for that model of headphones or some universal adapter with different kind of ports. Having additional features is not mandatory but they can be very useful, especially because many adapters offer many features for the reasonable amount of money. AptX is the Bluetooth profile that preserves the quality of the sound on your headphones (there is also A2DP profile that has the same purpose). If your receiver/transmitter features support for aptX low latency profile, you will be able to watch movies on your TV without any significant audio delay. It doesn’t really always work and it is important that the receiving and the transmitting device are compatible and support aptX low latency, but if you manage to combine them nicely, it can be really useful and refreshing. Not all Bluetooth headphone adapters have mics. Not all people consider they are necessary. If you do, you should get the adapter with built-in mic, but you have to make sure it is well positioned and that it works nicely so that the other person can hear you normally even if the mic is not right next to your mouth. The possibility to connect your receiver to two devices simultaneously is very useful. That means you can pair it to two phones or a phone and a tablet, so that you can, for example, take calls from one device and stream music from another. If you have the transmitter with this feature, you and your friend or partner can watch the same movie with two pairs of Bluetooth headphones when you don’t want to disturb other people. Many newer adapters are actually both receivers and transmitters. They can be quite cheap and even if you don’t think you need the transmitter, you might consider buying the transceiver as the secondary feature can be useful someday. The important thing is to switch between modes while the adapter is turned off. We have come to the end of this article on 17 best Bluetooth headphone adapters. We hope it was useful and that it will help you find the right adapter for you and your devices. PrevWhat You Need to Know About Audio Return Channel (ARC)? 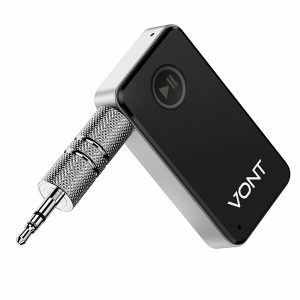 If your old sound system has an AUX port and no Bluetooth, the Vont Bluetooth receiver will make it like new. It works great! The best thing is that it connects automatically. If the Bluetooth is on, your tablet or smartphone will connect automatically the next time you turn it on. After using it for a week the experience with his is great. The design is awesome. It recharges quickly but I wish it could last longer than 6 hours (in my case). The sound is great, the build quality is quite good as well, and it’s also very easy to use. I would always recommend it! It says that the TaoTronics TT-BR06 battery life guarantees 15 hours working time. I personally think it’s too much. Does it really last that long? These playtime ratings are really tricky. The manufacturers of Bluetooth headphones and Bluetooth headphone adapters almost never state the testing circumstances. They will almost never tell you if the playtime was measured at 50%, 75%, or 100% volume. This is very important because the playtime depends on the volume. In most cases, when the volume level is not stated, you should assume that the playtime is measured at 50% volume. So, if the advertised playtime is 15 hours (without volume info), you can expect less than half of that at maximum volume. Actually, you can probably expect less than 6 hours since the correlation is not linear. If you are looking for a compact, good quality and fast charging Bluetooth receiver the Vont Bluetooth receiver is the ideal choice. This thing simply does its job. And it does it perfectly. I use it my car and it always picks up my phone signal without problems. I’m very satisfied with the purchase. Thanks for sharing your experience and for your suggestion. We have a small comment to make, though. If you do a little research, you will notice that some of the Bluetooth receivers on the market look exactly the same and have the same or similar features. For example, VONT receiver looks exactly the same as Mpow Streambot receiver (the first one on our list) and it’s very similar to TaoTronics TT-BR05. They are probably all made by the same manufacturer (they come from the same factory) but they are sold under different names. So, you won’t make a mistake if you buy any of those.